Guadalajara’s two leading soccer teams – Chivas and Atlas – will both be happy to see the back of 2015. Neither qualified for the playoffs in this year’s Apertura championship, which climaxed December 13 in a thrilling final that saw Tigres of Monterrey beat the Pumas of Mexico City in a penalty shootout after overtime. But with a new season comes new hope and Atlas, in particular, were handed a massive boost this week when one of their prodigal sons returned home in the twilight of his career. 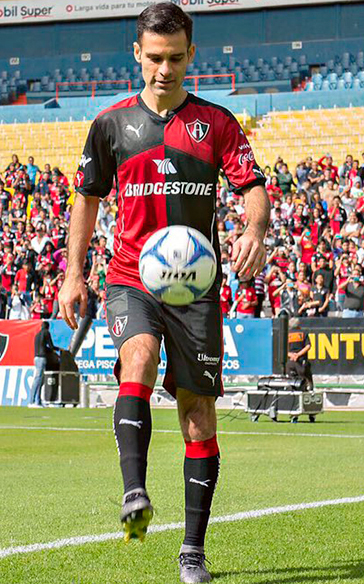 More than 200 Atlas fans waited in the arrivals area of the Guadalajara airport Saturday to greet Rafael Marquez, the 36-year-old defender who left the rojinegros (red and blacks) 16 years ago to ply his trade in Europe. Regarded as one of Mexico’s most successful ever players, Marquez this week signed a contract to play for Atlas in the upcoming Clausura 2016 season starting on January 8 (running through May 28). Marquez said winning Atlas’ first championship in 63 years would be the “icing on the cake” of a career that has spanned two decades, teams in five countries and 128 games for the Mexican national team, many of them as captain. Born in Zamora, Michoacan, Marquez made his debut for Atlas in 1996 at the age of 17 after rising through the club’s youth teams. He was sold to Monaco in France at the end of the 1999 season, when Atlas reached the Mexican championship final, only to be defeated by Toluca. After three years at Monaco, he was traded to the mighty Barcelona, with whom he won four Spanish and two European titles, becoming one of the most admired defenders in world soccer. After seven years in Spain, Marquez joined Major League Soccer’s New York Red Bulls before hooking up with Leon in the Liga Mx, winning national titles in 2013 and 2014. Marquez played for the past year with Hellas Verona in the Italian league before this week’s trade back to his first professional club – and possibly his last. Marquez has left his mark on Mexico in ways other than soccer, opening a foundation in 2005 to help the development of children living in marginalized situations.